Redesign a feature of KPCB company’s product. After rummaging through KPCB’s portfolio of well-known companies, I decided to take a closer look at Mango Health, an app designed to help people manage their medications and maintain their healthy habits. Studying the app, I noticed that the interface was a little clunky and could do with some retouching, like a more uniform card-based layout and color palette. The point of a redesign is to address one or many specific problems. So, before firing up my Sketch App, I reviewed Mango’s features and created a list of potential issues I could address. Note: If I had more time, I would get a larger group of people to download the app and tell me about their experience because more voices and observations are better than one, and learning from and designing for others is crucial in the design process. Hidden actions: not sure when to tap on something, if It’ll have an action attached, etc. After maybe only 10 minutes of using the app, I noticed quite a few usability issues. I decided that my goal was to simplify the app’s interface and make it more intuitive for its many different users. Since designing for people is my main priority, I decided to think about who these people were and what they would want out of the app. After defining these areas for improvement, I produced three different personas that I could refer to throughout the design process. Ill-equipped at my temporary dorm in New Zealand, I resorted to the basic pencil and paper method. I thought about ways I could make the home screen less cluttered by focusing on a list of tasks that would guide users throughout their day. In this particular case study, I redesigned Mango Health’s iOS app using my knowledge about design thinking and human-centered design. I focused on issues that real people would have and attempted to address their experiences before confronting the visual design aspect. From my observations, I developed potential solutions as ways to improve the app experience for a range of users. 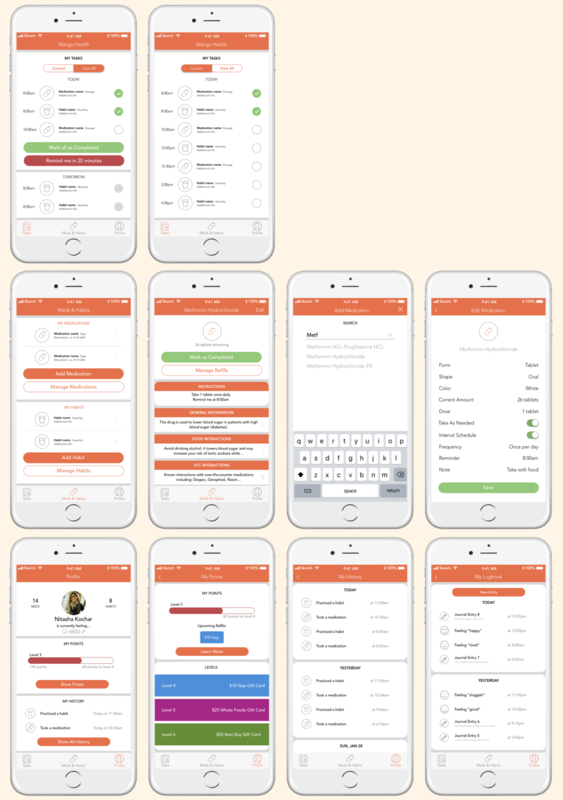 I reorganized the home page to emphasize tasks as a key feature of the app, I added in markers to convey which buttons and boxes had associating actions, and I enhanced the ‘mood’ feature by including the ability to log detailed experiences. 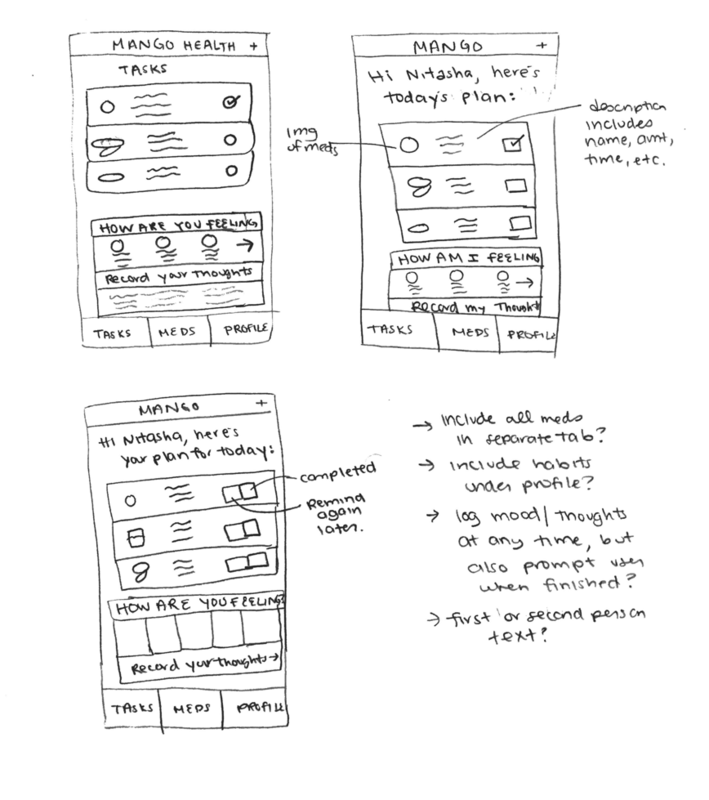 I first depicted my ideas on paper and then translated them into a final high-fi prototype.